In 2008, the College of Arts & Sciences had the pleasure of celebrating its centennial anniversary with exciting campus events and festivities – all commemorating the University of Kentucky’s largest college. In 1866, when the then Agricultural and Mechanical College of Kentucky admitted its first students, the faculty teaching art and science subjects numbered only seven. Today the College of Arts & Sciences is the largest college at UK with 18 departments, 14 interdisciplinary programs, 30 major and more than 400 faculty members. Nearly every student will take one or more classes in the college during their academic career at UK. During his time as UK’s first president, James K. Patterson pushed for the formation of a college within the university that would provide a solid foundation in the sciences, arts, and humanities. Formally established on April 14, 1908, the College of Arts & Science, as it was known, was part of a larger transformation the university underwent at the end of Patterson’s administration. Patterson left the college on firm ground when Henry Stiles Barker became president in 1910. Under Barker’s administration, A&S received an additional boost in 1912 when the Graduate School was formally established. As a result, by 1927 the departments of Psychology, Mathematics, Physics, and Chemistry were among the first in the university to offer the doctorate degree. The university president that played a significant role in the reorganization and expansion of the college during these early years was Dr. Frank McVey. During his first academic year as president of UK in 1918, McVey expanded the college from 13 departments to 22 and began extensively hiring faculty members with doctorate degrees. Although the university’s income dropped during the lean depression years, enrollment at UK continued to rise under McVey’s careful management. By the 1931-32 academic year, A&S continued to lead the second-ranked College of Engineering two to one in enrollment. 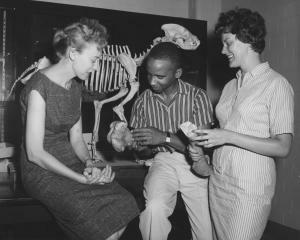 In order to accommodate the growing numbers of students, campus construction projects funded by federal money and local donations allowed UK to build several new buildings, including the Biological Sciences building, Erikson Hall, and an enlarged ROTC building. In 1944 the university created the Department of Geography and in 1945 began recognizing individual faculty members by awarding a yearly Distinguished Professor Award. In order to showcase the talent of the academic community, Board of Trustee member Paul G. Blazer and his wife Georgia launched the Blazer Lecture Series in 1947. This notable lecture series became an annual event to recognize the research of faculty members from A&S, as well as the university. By 1959, the college opened the Patterson School of Diplomacy and International Commerce which continues to prepare future leaders for careers in international affairs. The growing college received additional space in the 1960s with the construction of the Patterson Office Tower and Whitehall Classroom Building. Completed in 1969, the complex not only gave A&S additional classrooms but centralized the college’s location on campus. The past several decades have continued this tradition of growth and diversification and set the college on an exciting future path. The College of Arts & Sciences believes in the core values of innovation, creativity, connectivity and action, all of which represents our vision for the future of the college.